The Winter Of The Beard [1h47m] is a documentary which chronicles the lives of nine men across six months. Each was provided a video camera and weekly interview questions to document his own experience. The resulting 600 hours of intimate footage revealed a group of men traversing the same rite of passage from disparate vantage points. Throughout the process, the men told stories from their pasts, shared likes and dislikes, and confessed personal fears and aspirations. They laughed and cried, hid and came alive behind their beards. The tireless taping captured bad days and good ones, and it is in this framework that the individual stories stand out and the beards fade into the background. From a son dealing with his father's descent into Alzheimer's, to financial and marital struggles, to the birth of a child, THE WINTER OF THE BEARD [trailer, 2m58s] reveals the trials and tribulations of what it means to drastically alter one's appearance and otherwise go on living life. The trailer is in color, the movie on Vimeo is in black-and-white. Hooray for beards! I love beards. I will watch this. Can we get the "beards" tag on this, hippybear? I know I'm prejudiced, not having shaved for over 35 years, but I believe every guy would like to see at some point what you were given at the time when your parents rolled the dice. Every mans pattern of facial hirsuteness is very different, as you can see from the vid of these guys, I mean you've got every pattern from Kid Rock PWT to full-blown Etruscan mariners. Beautiful, I think. But maybe they'd never have known if not for this. I have over 30 nieces/nephews who think mine is way cool (my sons as well), but I'm the only one of all my siblings, (well, maybe one of my sisters, but we won't go into that) who has a beard. I kind of did the opposite. I photographed my head every day for a year, and shaved for six months of it. I have a beard most of the time, mostly because i like having a beard (and have wanted to have one since i was a kid), but also because shaving is annoying. I shave it all off every other month or two, and curiosly, i think the longest i've had a beard was around 6 months. My beard is thin and curly, so it gets pretty ugly and the mustache gets very annoying. It's funny how after a month or two the beard is no longer a beard but a statement or something. It almost lives a life of its own. Mine was a frequent topic of idle discussion, most people had opinions on it (i've been told many many times i should really shave, or really not shave), guys usually loved it, particularly the ones who couldn't grow one, girls usually hated it, it wasn't rare for people to want to touch it (some didn't even ask before doing it), i was even told i looked jewish in some cases, and one guy still jokingly calls me "killer" to this day (as in serial killer, coined at the peak of my unabomber look). I guess a beard is not just a beard anymore. Pretty fun, though. 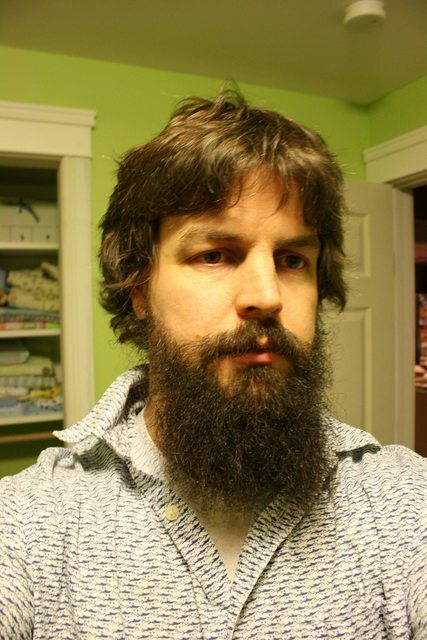 Aside from about 3 months or so a couple of decades ago, I'm well into my 26th year with a beard. I've worn it in all kinds of shapes and varieties, often with a very long moustache and closely trimmed, lately with a shorter moustache and much longer (yet shaped) beard, a rather anachronistic throwback look to 150 years ago or so. I found all the comments in the film about the annoyance of eating with a long moustache amusing. I've had my moustache long enough to come nearly halfway down my chin at times, but have never ended up eating it during a meal or anything. The main thing I notice about having a really long moustache is that when I'm drinking draft beer out of a pint glass or coffee during breakfast I need to have extra napkins so I can do a wipe after each sip. Otherwise, the liquid on my moustache drips and splatters. Overall, I thought this was an interesting frame for a diary-style documentary about men and their lives. It was a shame that they all seem to have shaved at the end of it. I had rather hoped that one or two of them would have said "no, I like this" and kept their beards. I guess a couple of them did regrow beards after the filming, so that much is good. I also think it was interesting that a lot of them seemed to just stop cutting all their hair altogether while growing out their beard. I also think it was interesting that none of them, at the end of the film, decided that maybe a beard worked but that the 6-months-without-trimming look didn't work and that a bit of shaping or other grooming might have worked for them. My beard is mostly grey now. When I was younger and it was mostly brown and blonde, it put me into a nebulous 20-40 age range for a couple of decades. Now, it's putting me into a nebulous 40-60 age range. I kind of like that there's a kind of averaging-out of age which happens with my beard, putting me into a broad category of age that I can grow and develop through while my looks remain pretty much the same. Having worn a beard for a very long time now, I do have to agree with the one observation in the film about how there's a kind of brotherhood of beard-wearing men, where a slight affirmation is given when seeing each other in public. I probably notice that small acknowledgement a bit more as a gay man who came out and was active during the age of cruising. And as a gay man who has tended to run in circles full of other bearded gay men and who appreciates facial hair on men as a primary facet of attraction, I may have more finely-tuned senses when it comes to a lot of these matters. But even leaving all that out, I really liked this film. The emphasis on there being a large collection of men participating was a bit diluted by the complete disappearance of a few of them during editing (even not counting the one who shaved and dropped out). But it was a really creative idea for a slice-of-life documentary, and I appreciated it enough that I hoped others would also if I shared it here. And as a gay man who has tended to run in circles full of other bearded gay men and who appreciates facial hair on men as a primary facet of attraction, I may have more finely-tuned senses when it comes to a lot of these matters. As a bearded non-gay man, reading your posts here has made me notice all the bearded gay men much more, and notice the rare occasions when I am assumed to be a member of that brotherhood. I definitely notice other men's beards, and am envious of particularly fine specimens. I'm a few months into a beard - with some trimming thrown in there - and it's funny how much better I think I look with it. More age-appropriate, stronger even. It doesn't hurt that it hides the double chin. But my dilemma is that I'm a lawyer, and one almost never sees bearded lawyers (mustaches seem acceptable). It's a trust issue. So I may need to shave soon, which is a shame as I'd be very curious to see how it looks after a few months more. Last time I did this my daughter cried when it was gone. I grew a goatee in college and kept it for 20 years, then expanded to a full beard a couple of years ago. Sometimes I'm curious what my face would look like clean shaven, if my wife and son would even recognize me. I know it would grow back, but I'd no sooner shave it off than cut off my nose. My father had a beard in the '70's when that was decidedly not done. He was sitting in a movie theater and trying to see the closing credits on a movie. (Our family almost always sits through the closing credits in movies.) The woman in front of him stood up but instead of moving along, stood there talking with her friend. My father politely asked her to move, and she looked him over and said, "Maybe you could *see* better if you shaved your *beard. *"
He was too polite to retort. Not for nothing he was called "Smilin' Neil." Sometimes I'm curious what my face would look like clean shaven, if my wife and son would even recognize me. I shaved mine once, as an experiment. My wife looked sad, because I didn't look like me anymore. Then I covered the lower half of my face with my hand, and she burst into tears because now I did look like me again. I grew the beard back as quickly as I could. palbo: "I have a beard most of the time, mostly because i like having a beard (and have wanted to have one since i was a kid), but also because shaving is annoying." Really, sometimes I think people (even men!) forget that it is only through effort and encounter with a sharp piece of metal that is literally cutting something off my face that I don't grow a beard. Whenever I get lazy for a while and stop shaving, inevitably someone will ask, "Are you growing a beard?" And really, no, I'm not doing anything at all; this is what inactivity looks like. If anything, people should go up to cleanshaven people and say, "Ah! Preventing a beard, I see." I like to grow my beard out in the winter - it's cold where I live (well, not this winter, but usually!) and the beard helps keep my face warm, plus it's nice to take a break from shaving. I never considered this "drastically altering my appearance" or a "rite of passage" worthy of a film documentary, or anything like that! Just my seasonal, winter ritual. And when it gets warm in springtime, I like to shave it off and get that sense of jamais vu (sp). (I also manage to resist the temptation, while shaving, to see what I would look like, fleetingly, with a Hitler moustache!). I grew the beard back as quickly as I could. Picture a constipated toddler on the toilet. The look of utter seriousness. The furrowed brow. The red face. The rigid posture. The slightly crossed eyes. The look of deep satisfaction when it finally plops out, all at once, fully formed, a satisfying rich brown mass. Wait, I changed my mind, I want to choose a different analogy. hippybear: But seriously! I'm alone, in the shower, nobody else is home, I'm shaving off the beard, and it crosses my mind to see what it would look like! But I can never quite do it, because IT IS JUST SO WRONG. (I also manage to resist the temptation, while shaving, to see what I would look like, fleetingly, with a Hitler moustache!). Easily the best part about shaving a beard (admittedly not a high bar since it's not exactly fun) is the chance to give yourself goofy facial hair unfit for public wearing. Muttonchops! Fu-manchus! Van Dykes! Actually, the last two times I've shaved it all off I kept the moustache for a little bit so I could do Halloween as Magnum PI and Ned Flanders, respectively. You can't beat real facial hair for a prop. I recently shaved off my winter beard after 3 or 4 months (it gets hot down here, y'all). I sort of miss it. My first beard started last year when the airline lost my luggage (and therefore my razor) for a week or so. I think it will become a winter tradition for me. I got lots of compliments and I feel like I probably did look better with one. Copronymus: "Easily the best part about shaving a beard (admittedly not a high bar since it's not exactly fun) is the chance to give yourself goofy facial hair unfit for public wearing. Muttonchops! Fu-manchus! Van Dykes! " Yeah I have several cell phone pictures of me in various stages of shaved. I would also stop and show my partner at each iteration. He just shook his head and looked mortified at my chinstrap-into-fu-manchu-minus-mustache creations. > Sometimes I'm curious what my face would look like clean shaven, if my wife and son would even recognize me. My dad shaved his beard when i was ~15 after having a beard ever since i had memory (bar a short ungodly goatee period). It was absolute shock, and to this day i know that man is my dad, but my brain refuses to acknowledge it. Last time we went to a show it looked like an f'ing lumberjack convention. Baa! Baa! Baa! I grew my beard before it was cool, and I'll keep it long after it goes out of style. Because I have no chin. That's a good reason. And I don't like making my wife cry. That's two reasons. Two reasons to keep this beard. Also I am old enough that nobody will mistake me for a hipster. Three reasons. To keep this beard. 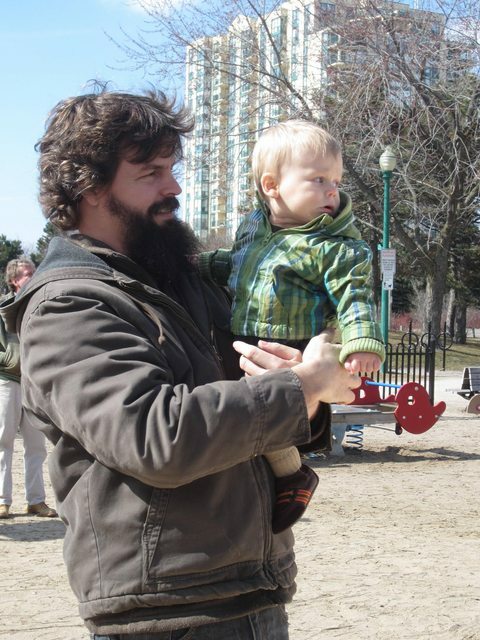 That I recently and publicly compared my beard to toddler poop is let's say a reason against. So we're back to two reasons. Two reasons to keep this beard. And I only need one. Because there is only one beard. So right there by myself I've justified some hipster's facial hair. I feel like I've done my good deed for the day. Longest I've grown my facial hair is about a week and a half; when does the itching stop? Dryness can make itchy stubble worse. Try massaging a little olive oil into your beard about an hour before you wash your face. That's a good idea...I actually use an olive oil-based shaving soap, and since I started that I never get itchy after shaving. I wish I could grow a beard, since I really like the way they look on people who can pull them off. But...it just doesn't work out for me. It's funny how after a month or two the beard is no longer a beard but a statement or something. My goodness yes. I haven't shaved in 11 months or so, and my identity at work and socially is beginning to completely revolve around my beard. It has been interesting as a high school teacher to watch student reaction - my beard is adored by many and I think it may even help give me "outsider" status which seems to endear me to the more downtrodden of my students. Haven't really decided what to do with it yet, I'll see what happens after the 12 month mark. It could be tricky as my son (who is approximately the same age as the beard) might freak out if it disappears without warning. I really really envy you guys with beards. I'm 37 and I have the facial hair of a 14 year old. The good part is that I only need to shave every couple of weeks. The bad part is no beard. The itching is because the shaving you've been doing has been creating sharp ends on the hairs as it cuts, and some of these are poking their way back toward your skin as they grow. Also a certain portion of them were probably shaved below the skin line and they are actually poking your skin from underneath. The itching will stop as soon as ALL your hair follicles on your face have had a chance to advance their product (your beard hairs) both out of your skin and long enough that they aren't poking back at your face. This is typically between 2 and 4 weeks, depending on how fast your beard grows. Moisturizing (as suggested with olive oil) can help alleviate this, as it both softens the growing hair and helps the skin allow the hairs out which aren't lining up properly with their appropriate pores. I've heard (but have no personal evidence for, as I really haven't shaved in years) that if you let the stubble get long enough to actually trim even with no clipper guard on the trimmer, that you'll cut off the sharp ends of the hairs made by the razor and this will help cut down on the itching.